Compare the daily life of the first people who settled in the Americas a long time ago. What did they wear? What did they eat? How did they live? Build a totem pole. Weave a dream catcher. Enjoy a potlatch! Make pawpaws. Read the story of a very clever coyote, a very bad raven, and a very wise owl! Cheer the snow snake games, meet the arrowmaker, interpret secret messages and symbol stories, discover why baskets and blankets were so important. Explore pow-wow etiquette, the medicine men, and the butterfly games. Learn what these early people considered wealth and health and protection from spirits. Enter the world of the Iroquois, the Navajo, the Sioux, the Cherokee, the Lenape, the Ojibwa/Chippewa, the Seminoles, the Apache, the Anasazi, the Pueblo people and more! 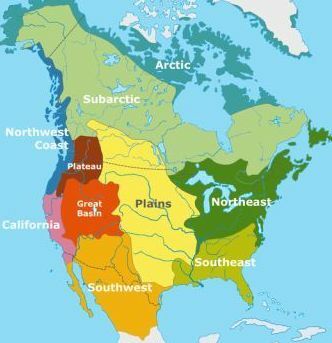 The first people in the Americas arrived in North America across a frozen sea from Asia over twenty thousand years ago. They spoke many different languages and had many different customs. Some were hunters and gatherers. Some became skilled farmers and clever builders, engineers and weavers. As different as the many tribes were, they all made incredible art, pottery, baskets and blankets. They loved games of skill and of bravery. They created stories and poetry. They taught their kids about their beliefs and culture using games, myths, dance, and impersonation. Today, there are over 500 federally recognized Native American tribes in the United States alone. Tribes are ruled by representative tribal governments. Native Americans today have a variety of jobs, including doctors, lawyers, engineers, teachers, ministers, writers, artists, and workers of all sorts. But they also hold jobs like tribal leaders. Neat frame houses have replaced former wigwams and tepees. Kids go to public school. Some kids additionally attend tribal school, especially tribal pre-school, where they learn about their traditions and history. Much has been lost, but much has been saved through the hard work of today's tribal leaders. We thank everyone who awarded this site. It's quite an honor! who collectively call themselves "The People"
Washington State History Museum, Tacoma, WA, for our private tour, and an opportunity to learn a great deal about the early Americas. Thank you! Dr. Adams. Over the years, Dr. Adams has been a consultant to the Sioux, Winnebago, Fox, and other tribes in the Midwest on community development. He also participated in a federal project for communication and values differences among cultures, resulting in a website - a multicultural toolkit.